For chisels and plane blades to work effectively, their backs have to be absolutely flat. The back of new tools is often not 100 % even or still shows traces of grinding from the manufacturing process. To obtain a sharp cutting edge, the back must be smoothed. Depending on how deep the grinding traces or how even the back is, it may have to be roughened first. 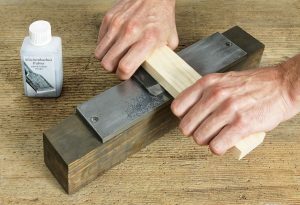 Western chisels and plane blades can be trued on a diamond block (e.g. No. 705358), in which case it is sufficient to true the first two-thirds of the back. After that, the back is ground further with finer grit stones and honed with the finest sharpening stone. Japanese blades can be trued on diamond blocks (No. 705382) or using a steel lapping plate (No. 713600) and silicon carbide powder (No. 713603 or No. 713604). On the lapping plate the blade is worked with silicon carbide powder and water under high pressure. For easy pressure distribution a piece of wood will serve best. The powder grinds into a fine paste that has an additional polishing effect. The back is normally only trued once on brand-new tools using flat, trued hones. After that, the back is only honed on a fine sharpening stone. Subsequently, the blade‘s bevel is sharpened at an angle between 23° and 40°, depending on the tool‘s purpose. 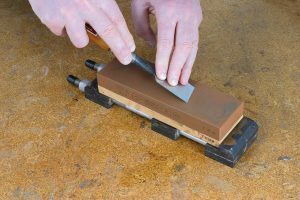 For checking the bevel angle, we recommend using a bevel gauge for tool edges (No. 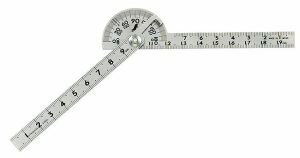 707261) or a mini protractor (No. 717141). The smaller the bevel angle, the lower the cutting resistance and the more delicate the cutting edge. 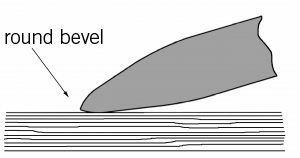 Determining the optimal bevel angle is a process that depends on the type of wood, the cutting method, and the quality of the tool‘s steel. Several trials may be required. The angle table at the beginning of these instructions serves as a guideline. To a large degree, tools are sharpened in the same manner as knives. First, the bevel is ground using a 1000 grit stone. The bevel is placed on the stone diagonally and ground using straight movements while the angle is kept as constant as possible. Rocking and tilting movements should be avoided. 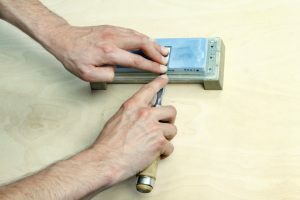 In order to work efficiently and to wear the sharpening stone evenly, the entire surface of the stone should be used. When finished, proceed to a 4000 or 8000 grit stone and hone both the bevel and the back of the blade. 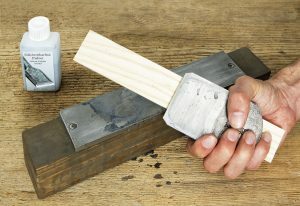 To improve the honing effect and give the blade a mirror polish, a Nagura stone can be rubbed onto the sharpening stone to create a fine-grain polishing paste. A rocking motion while sharpening will cause the blade to take on an inaccurate rounded geometry. Similar rounding of the bevel is caused by fast-moving felt polishing wheels, which we do not recommend. 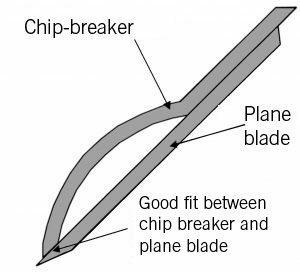 To ensure that a plane functions well, it is not sufficient to sharpen the blade alone. The chip-breaker also needs to be flat in order to guarantee a secure fit with no play and to prevent clogging with wood shavings. When sharpening thick (Japanese) blades that have a large contact surface area, maintaining a constant angle is easier than with thin blades. 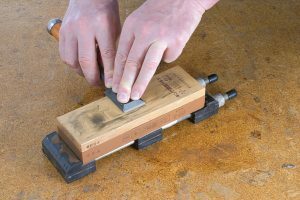 One way to check how evenly pressure is being applied is to look at the tracks on the sharpening stone. 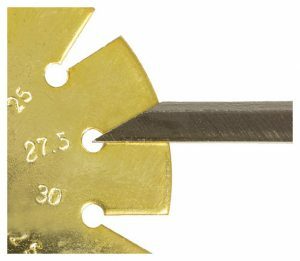 A honing guide is very useful for helping maintain an exact bevel angle (e.g. No. 707168).